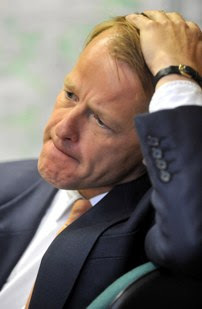 I was sitting in Portcullis House yesterday when David Laws moseyed past and it got me wondering why he had not begun his comeback yet. Both Nick Clegg and David Cameron did at one point suggest they wanted him back as soon as possible, but it seems their efforts are being frustrated. In May Parliamentary Standards Commissioner John Lyons found that Laws had committed six breaches of expenses rules, in particular claiming for rent paid to his landlord, who also happened to be his partner. 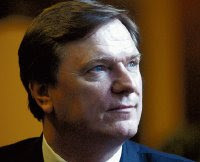 The Commissioner suspended Laws from the Commons for seven days, ordered him to apologise and pay back some money. It looked like that would rule out an early return to the Cabinet but it hasn’t stopped the Government whips trying to get him started elsewhere. In particular, Lobbydog has learnt, they have been trying to get him on the pre-legislative scrutiny committee for the Financial Services Bill. The problem is that Labour is having none of it and has constantly objected to his inclusion, given the expenses misdemeanour hanging over his head. The committee was meant to be set up before the summer recess, but things have dragged on so much over the issue that it now looks like it won’t be established till September – possibly delaying the overall progress of the Bill. Hacking Inquiry's full draft terms of reference..
c. The extent to which the current policy and regulatory framework has failed; and the extent to which there was a failure to act on previous warnings about media misconduct. c. The future conduct of relations between politicians and the press. 3 To inquire into the extent of unlawful or improper conduct within News International and other newspaper organisations. 4 To inquire into the way in which the police investigated allegations of unlawful conduct by persons within or connected with News International, and the review by the Metropolitan Police of their initial investigation. 5 To inquire into the extent to which the police received corrupt payments or were otherwise complicit in such misconduct or in suppressing its proper investigation and how this was allowed to happen. 6 To inquire into the extent of corporate governance and management failures at News International and other newspaper organisations. 7 In the light of these Inquiries, to consider the implications for the relationships between newspaper organisations and the police, and relevant regulatory bodies and to recommend what actions, if any, should be taken. The first part of the Inquiry (1) and (2) will be conducted by a Judge assisted by a panel of experts. It will report within 12 months. The second part of the Inquiry to be considered in light of the ongoing criminal proceedings. It will report jointly to the Culture Secretary and the Home Secretary. “I think it’s important to go a step further on this issue as there is already Government and Opposition support for the motion specifically dealing with BSkyB. “The things that are happening now are a symptom, but what is the underlying issue? “The UK papers and media are in very few hands and that’s why the people that own them have enormous power and that’s what needs to be addressed. “The amendment is putting a mark down asking that we look at the serious underlying causes, of diversity and plurality in ownership, and consider proper regulation. Labour Uncut’s Dan Hodges correctly commented yesterday that Ed Miliband’s decision to negotiate with Cameron on the main motion today had shown he understood when to “take the win”. Given that is the case I don’t see this amendment going through today, but – in the same way that political and constitutional reform became significant after expenses – the ownership issue is live and will be the next thing on the agenda. Those Politics.co.uk boys are great, but I had to chuckle when I saw the website's coverage of today's phone hacking hearings. Check out the ad in the bottom right of the screen grab. The ad boasts : "Have you ever been curious as to what your children or employees are chatting about on their cell phone? you could now listen in 100% completely undetected." 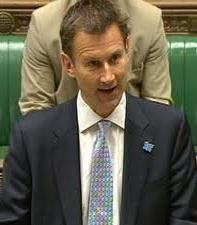 Hunt was answering one of a barrage of prickly questions after his statement on the BSkyB takeover and he gave satisfactory answers to few – he did not know, could not say and, on one excruciating occasion, said the knowledge required for the answer was above his “grade”. This was an occasion that demanded a brass neck, a deep voice and a steely eye, yet Hunt had the demeanour of a man angry that his butterfly collection had been tampered with. We shouldn’t be too harsh on the Culture Secretary though – he arguably played a horrendous hand as well as it could be played. For one thing the situation has been changing so fast today that he would have had little or no time to prepare his statement. But crucially, such is the importance of this issue now that the Prime Minister should have been in the House to take questions. David Cameron’s absence will be remembered, and it meant Hunt was always going to find it tough against an Opposition Leader with invigorated confidence on the Commons floor. There is no other event that can possibly have been as critical right now as a debate on the BSkyB deal and trying to suggest that it is Hunt’s portfolio and place to respond, while technically correct, simply made it feel as though the Culture Secretary was being used as a human shield. Home Affairs Committee Chair Keith Vaz has confirmed that Assistant Commissioner John Yates will appear at a hearing tomorrow concerning questionable phone hacking evidence he gave to the same committee in October 2010. Vaz said: "Following recent media reports I am most grateful to Mr Yates for agreeing to give evidence to the Committee next Tuesday. "It is important that we establish a timeline as to exactly what has happened with the various police inquiries."